The Samsung Digimax V800, part of Samsung's high-end V-Series of digital cameras, is equipped with an 8 Megapixel high-resolution CCD that employs true color filtering, giving the camera the ability to express accurate colors. The Samsung V800 also features a high-quality f/2.8 - 5.1 Schneider Kreuznach 7.8mm - 23.4mm lens (equivalent to a 38 - 114mm lens in 35mm format) and also provides a 10x digital zoom, enabling a combined zoom of 30x. The Samsung Digimax V800 also boasts a large 2.5 inch color LCD (approximately 230K pixels), providing the shooter with a clearer and brighter viewing area. 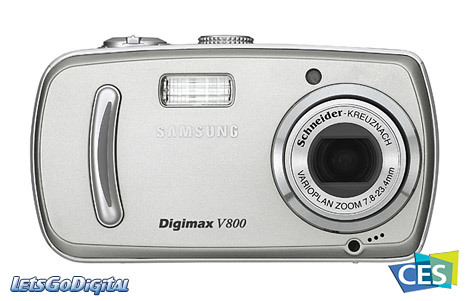 The Samsung Digimax V800 digital camera is currently available and has an MSRP of $399.99. Samsung Digimax V800 digital camera - For the advanced shooter looking for additional control, the Samsung Digimax V800 features powerful manual functions. Three kinds of manual exposure adjustment such as Aperture Priority, Shutter Priority and Manual adjustment, as well as Manual Focus are available. 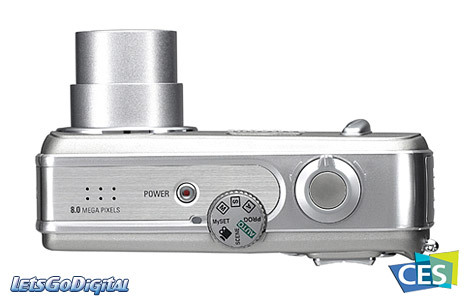 In particular, exposure can be easily adjusted using the jog dial located on the top of the camera. Furthermore, an Auto Exposure Lock function enables you to configure a scene and set exposure as required. Faster in operational speed than its sibling the Digimax V700 (launched at PMA 2005), the Samsung Digimax V800 features faster booting and shot-to-shot speed for instant photography; shooters can take images as soon as the power is turned on. Because the high-speed shot-to-shot capability allows continuous high-speed shooting, users can rest assured that they will be able to capture their shots without missing any of the action. Samsung V800 digital camera - MPEG-4 and Video editing - For enhanced movie-shooting, the Samsung Digimax V800 supports MPEG-4 video compression, providing recording times which are 3 to 4 times longer than conventional digital cameras. The Samsung V800 has the ability to capture movie clips in VGA (640 x 480) at 30fps, and also boasts a movie clip stabilizer for video recording. Through automatic detection and correction of lateral and vertical camera movement caused by the shooter's unsteady hand, the recording of the subject itself is kept steady. The camera also features movie clip editing functions, which were previously only possible with the use of a PC. Users can now make better videos with options such as the ability to select a part of a movie clip for saving during playback as well as the ability to select part of a movie clip to be saved as a still image, all performed right on the camera. The enhanced movie mode options don't stop there as the Digimax V800 features successive video recording based on unique Samsung technology. With successive recording, shooters can pause and resume video recording at any time and merge multiple video files into one single file. Samsung Digimax V800 digital camera - Special effects - The Samsung V800 also features special effect functions that add a new level of creativity to the digital photography experience. The special effect modes are Color Effect, Highlight, Photo Frame and Composite Shot. Color Effects include B/W, sepia, blue, red and green and Highlight enables you to emphasize a subject by putting its surroundings into soft focus. Composite Shot allows you to divide a shooting scene into 2-4 segments and save them into a single file while Photo Frame allows you choose from 9 different types frames to add to an existing image. Samsung V800 camera - Exposure and GUI - The Samsung Digimax V800 has Continuous Shooting, Auto Exposure Bracketing (AEB) and Auto Focus Bracketing (AFB) functions. Continuous Shooting helps catch all the action by taking consecutive shots, AEB shoots a series of pictures with slightly different exposures and AFB takes shots which focus on different elements of the frame. The Samsung Digimax V800 also features an improved Graphic User Interface (GUI) that ensures faster and more seamless menu navigation. 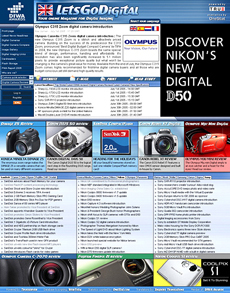 Menu settings can be accessed quickly and with ease, by using the camera's Move and Set functions. With its Auto Macro function, the Digimax V800 automatically adjusts the shooting distance and focus from 4cm to infinity, obtaining crystal clear images regardless of their shooting range. Samsung Digimax V800 - LCD display and Histogram - For even more exposure control, the Digimax V800 provides a histogram showing a variety of shooting information, including brightness and contrast, to help the shooter adjust exposure seamlessly. The histogram, which is displayed on the camera's 2.5 inch LCD in real time, enables easier aperture control as well as verification of picture quality upon shooting, all helping the user capture better pictures with accurate exposure adjustments. Samsung V800 - Scene mode and Software - The V800 digital camera also features eleven scene modes applicable for a number of shooting environments. The scene modes include Night Scene, Portrait, Children, Landscape, Close-up, Sunset, Dawn, Backlight, Fireworks, Beach & Snow and Text Recognition. In particular, Text Recognition is a feature that allows you to shoot documents such as books, papers and magazines and then extract text from the image taken using the bundled "Digimax Reader" text recognition software. The Samsung Digimax V800 also comes with the all-in-one software Digimax Master 1.0. Digimax Master integrates the viewer, still image/movie editing and editing functions into a single application. After saving pictures using the Auto Download feature (images automatically moved to your computer on connection), the user can run the Digimax Master application to edit the pictures in the way they want. Samsung Digimax V800 camera - PictBridge & Secure Digital - The Samsung V800 also offers PictBridge technology, allowing users to connect the camera directly to a printer by using the supplied USB cable and output images right from the camera's internal memory or SD card. The shooter can even use the "Quick Print" button to print a desired photo immediately. In addition, the Samsung Digimax V800 provides a substantially faster transfer rate with USB 2.0 as compared to commonly used USB 1.1. The Samsung Digimax V800 takes advantage of the small form-factor of SD/MMC storage cards and is also equipped with 32 MB of built-in memory, which comes in handy when shooting without a memory card. The camera also provides various user-friendly functions such as My Set shot mode, which allows the users save customized shooting settings. The Digimax V800 also provides voice recording up to 1 hour, voice memo for adding a short voice message to a picture and "One-touch Playback" for instant playback of an image.